Aposter reproduced in Kenneth C. Burt’s 2007 book The Search for a Civic Voice: California Latino Politics accompanies his discussion of the events surrounding the 1966 CA gubernatorial election. At the top of the poster are two words that were also the catch-cry of Reagan’s Latino supporters: Ya Basta! 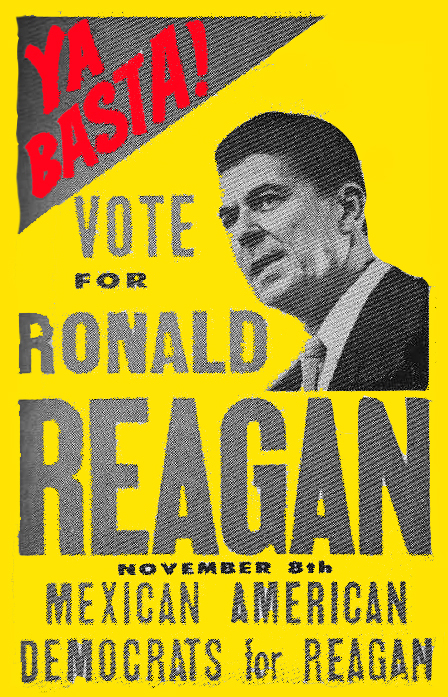 “Vote for Ronald Reagan”, the poster goes on to say, and is sponsored by Mexican American Democrats for Reagan. The poster is on prominent display in the Ronald Reagan Library in Simi Valley. Ya basta literally means “enough already”, and while it’s unclear from this distance in time whether the phrase referred to the ongoing farmworkers strike, during which Cesar Chavez had put his support behind the Democratic candidate and incumbent Pat Brown; the unrest on university campuses, which included the highly controversial push for Chicano Studies departments; or California’s high taxes, it is enough to give pause for thought as this year’s gubernatorial election rolls around. After all, the “Tea” in “Tea Party” began life as an acronym for Taxed Enough Already. Reagan won that election 58 percent to 42 percent, carrying every county except San Francisco, Alameda (also in the Bay Area) and Plumas County in the Sierra foothills. According to reagansheritage.org, the Gipper “emphasized law and order, wasteful government, welfare, over-taxation, and student disturbances at the University of California”. Many Latinos involved in Republican politics today attribute their choice of that party to Reagan’s outreach to the Hispanic community. Nor is there any such thing as Latino blood. The word refers to having origins in Latin America, which encompasses all those countries in South, North, and Central America, plus the Caribbean, whose language derives from the Romance family of languages—including Portuguese. A Brazilian is Latino, but not Hispanic; someone whose family came to the United States from Spain is Hispanic, but not Latino. Hence the convoluted questions that must be asked in any attempt to gather statistics, such as this year’s Census form. Question 8 on the form asks if the person filling it out is of Hispanic, Latino or Spanish origin, and splits that into the three most politically significant blocs: Mexican (predominantly in the Southwest), Puerto Rican (New York), and Cuban (Florida). Question 9 asks about race and, for the first time, this year the Census form is allowing people to write in their race—which for many is likely to be “mestizo” (of mixed Spanish and indigenous blood). This interactive map on the Spanish-language channel Univision’s website gives a much more detailed picture of where the Hispanic population is distributed in this continent’s EU (Estados Unidos). English is sufficiently similar to Spanish for you to figure out what the map is telling you, although if you click on the second tab, which gives you percentages of the total population in the individual states, you should know that “negocios” means “business” and “mujeres” means “women”. http://translate.google.com will help you if you’re lost. In everyday usage, however, “Hispanic” and “Latino” are usually interchangeable. It largely depends on whether the speaker wants to adopt Nixon’s language-based categorization, or the geographically based word that’s derived from Spanish “latinoamericano”. 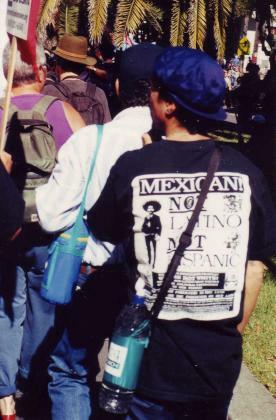 The dictionary definition of “Chicano” is “American of Mexican descent”, but the word has retained a kind of radical edge to it, partly because it is nationalistic and partly because of the Chicano movement in the late ’60s, early ’70s, whose leaders would deride Mexican American elected officials and candidates for “tio-tacoing all around and claiming to represent us.” (Tio Taco is the equivalent of Uncle Tom.) Because Mexicans are not the only national group who come into the USA from Latin America, and because it’s the language-based census question that drives polling and voter classification, I’ll use the somewhat un-PC term of Hispanic. Another way to refer to the people south of the US border is los sureños—the southerners. Those sureños who come north have the same motivation to find a better life as did the “Yankees” from the eastern United States who went West once Mexico’s northern province of Alta California had been taken from it by the Treaty of Guadalupe Hidalgo in 1848. Furthermore, apart from that prior land claim and the ease of today’s travel, the only real difference between the migration from Europe to the eastern United States around the end of the nineteenth century and today’s migration is that nowadays you can wire money home the day you earn it, and communicate with your distant loved ones on the phone or the Internet. The youthfulness of the Latino/Hispanic demographic in the United States has led to their categorization as Generation Ñ (pron. ENya). The term was copyrighted in 1995 as a full-service brand, a magazine of that name was launched the next year, and it now has a broadband presence focusing first on Miami, but planning to expand into New York and Los Angeles this year and next. The website declares “This is Latino 2.0”, and features shows such as 45 RPM. I recommend Episode 8, about two young entrepreneurs who have started a music production company. Entrepreneurship is one of the “four chambers of the Hispanic heart”, according to communications research company founder Leslie Sanchez in her 2007 book Los Republicanos: Why Hispanics and Republicans Need Each Other. The other three chambers are family, spirituality, and collectivism. Democrats, she says, appeal most to Hispanics when they say a tax hike will benefit children, or that social spending will improve your community – while Republicans’ strong emphasis on religion and enterprise appeal to the two other chambers of the Hispanic heart. You only have to look at the healthcare debate to see how the rhetoric cleaves to those divisions—the Republicans lauded the free market model of health insurance and let the religious pro-life support base have its head, while the Democrats pointed to denial of care to sick children and the necessity for the government to spend money to benefit everyone, not just the rich. You have to wonder if all the brouhaha and lockstep voting on the part of the Republicans and arm-twisting on the part of the President has more to do with the 2010 Census and what it will reveal about the Latino/Hispanic presence in the United States than it did about healthcare reform. The Hispanic vote, no matter how small its percentage of the national vote, is large enough in some states to make the critical difference between winning and losing. One commentator on the business-oriented Fox and Hounds blog called the ad political suicide even within the Republican Party—“Poizner’s done; it’s time to stick a fork in him”. Poizner’s next ad characterized the Republican frontrunner Meg Whitman’s stand on immigration as being the same as Obama’s—amnesty. At this point in California’s election cycle, immigration is not a big issue, although that may soon change, especially if Congress takes it up. A Field Poll conducted in early March, and made nicely graphic in the Sacramento Bee, shows that the top five issues people are worried about right now in the Governor’s race are jobs and the economy, the state budget deficit, education, health care, and taxes. Illegal immigration comes in sixth, but the disparities between Republican and Democrat concern about this issue are the largest—58 percent for Reps and 27 percent for Dems. The poll was conducted among a random sample of voters in English and Spanish, but breaks out the results by party only. Given the huge diversity within the Hispanic community, it would be wrong to assume that all Hispanic voters are in favor of, for example, amnesty—and many norteños who have been here for generations, or who have acquired citizenship recently, may feel that neither party actually wants to do anything about immigration anyway. Decades of rhetoric up until this time have accomplished nothing except for sporadic “fixes” at all levels of government that resulted in pain all round and no gain. Except perhaps for police departments, as shown by this story about the confiscation of cars being driven by people without a license—which implies they’re undocumented, aka “illegal”.